A note from our files on a Gibsons Home Inspection dealing with a partially replaced roof. Here’s something that you don’t see very often. There is a new roof on only half the house. The south side has older ‘3 tab’ shingles whereas the north side has modern ‘laminate’ type roofing material. The seller advised that the attic originally did not have adequate ventilation which, combined with a shaded north side reducing drying capacity, deteriorated the sheathing on the north half. As a result, that side of the roof was completely rebuilt, from the sheathing up. I noted abundant roof ventilators are now present. 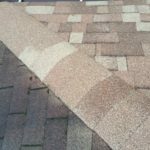 If the seller had not been present, the home inspection report would have noted this ‘disconnect’ with the recommendation to follow-up with the seller as to the reason for doing only half the roof. In this case the home was well maintained for its age and showed pride of ownership.